Installation image of Sq’éwlets exhibition. Photo by Lori Johnson. This is the final week that the exhibition SQ’ÉWLETS: A Stó:lō–Coast Salish Community in the Fraser River Valley will be on display at the Chilliwack Museum and Archives. The exhibition will wrap up this Saturday April 28th, with a closing ceremony held from 10am to 11am (the exhibition will remain open until 2pm on Saturday). All are welcome to this community event. During its 5-month span, the SQ’ÉWLETS exhibition has welcomed over 800 visitors. With a strong interest from local schools, our staff provided exhibition tours to nearly 200 students in the community. This spring, we also ran our first classroom-in-residence program, which provided two classrooms with a dedicated period of time to engage with, and study, the exhibition. With informative panels, photos, touchable objects, a material identification activity, video, and a touchscreen portal to the exhibition website, there is a lot to see and do for folks of all ages! 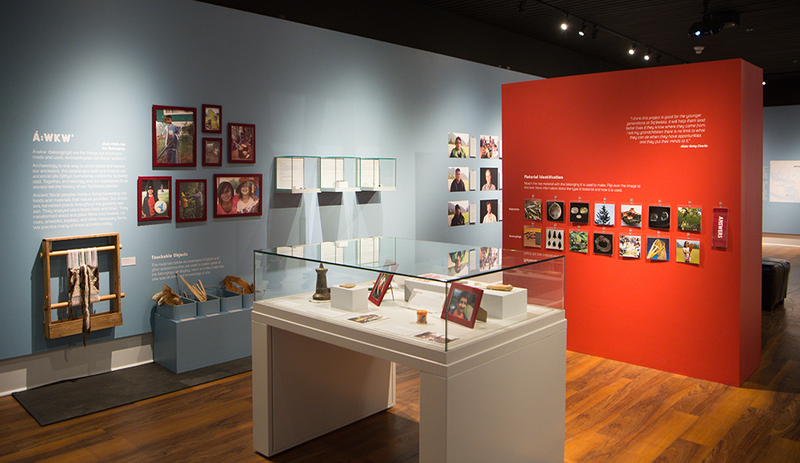 This past year, one of our 60th Anniversary projects was to obtain new, Canadian-made, conservation-grade exhibit cases. We have been thrilled with the results. These cases, installed in late October, will allow us to project and celebrate our rich, Chilliwack-focused artifact collection, for the next generation, at least. Thanks to everyone who made this dream a reality! 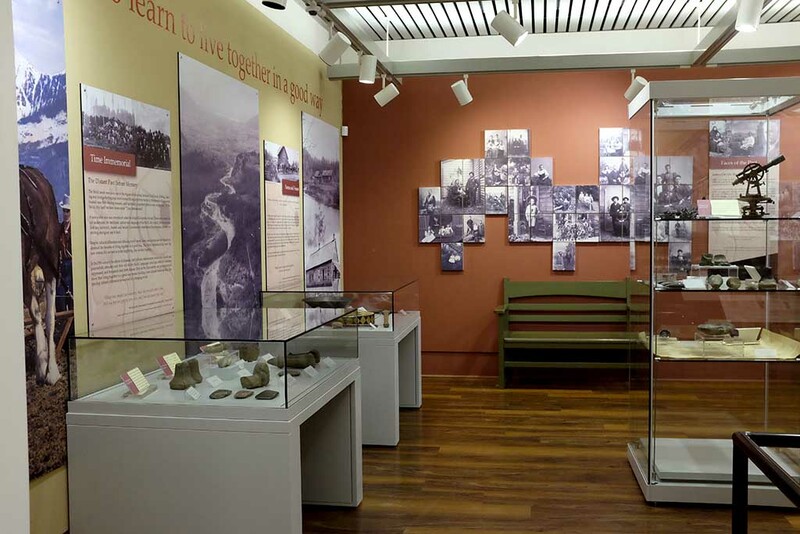 If you haven’t yet stopped in to the Museum to check it out – come and experience it for yourself! Completing that project, however, yielded a new one. What would we do with our existing casework? 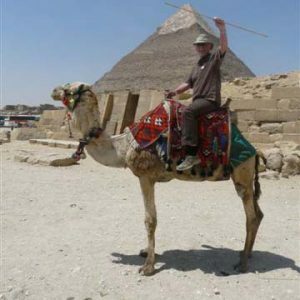 We definitely did not have room to keep it on site in the Museum! 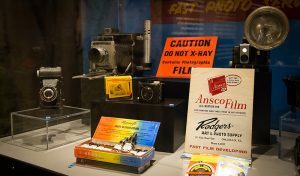 Over the decades, we had ourselves benefited from the generosity of other Museums, which had “cascaded” some of their old exhibit cases down to us. In addition, in past years we had a few cases produced locally for us, which were totally functional, and still had great lifespan in them. We asked around, as we are in contact with other Museums and cultural organizations here in the Fraser Valley. Thankfully, three organizations let us know that they could put the cases to good use! 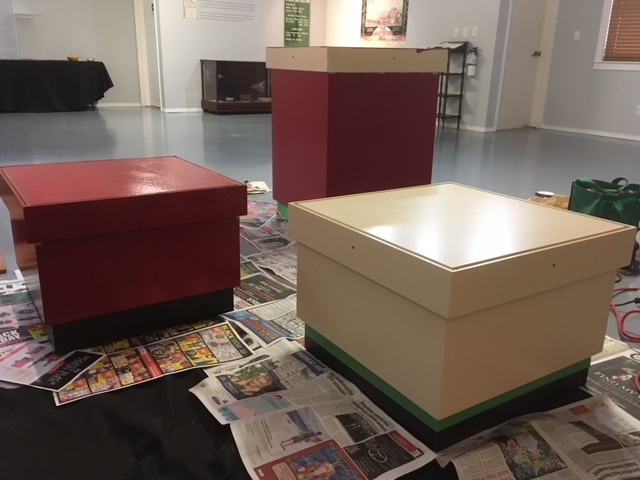 Cases recently provided to Trethewey House Heritage Site in Abbotsford are being painted for their new format. At the Stó:lō Research and Resource Management Centre, the experience was similar. Our Curator, Adrienne Rempel worked with their Director, Dr. Dave Schaepe and their Education Coordinator Amber Kostuchenko, providing them with some of our older casework. 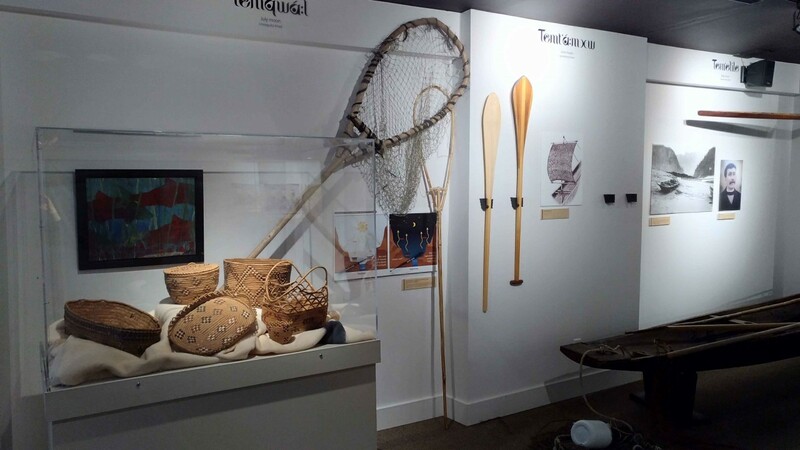 It looks tremendous in their newly renovated Shxwt’a:selhawtxw (“House of Long Ago and Today”) Interpretive Centre. 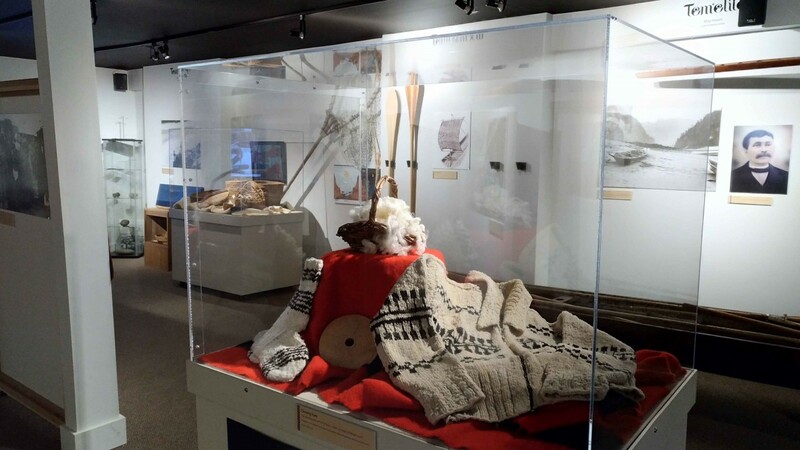 Cases in the newly renovated Shxwt’a:selhawtxw (“House of Long Ago and Today”) Interpretive Centre. A couple of the other cases are remaining with us, to be used for our own Education and Engagement programs, as well as smaller-scale exhibits located in our Archives location at Evergreen Hall. The rest of our former cases have been donated to the CFB Chilliwack Historical Society, and are already making a major difference in their presentation galleries, which are located on Hocking Avenue in Chilliwack. Stay tuned for that story! In the meantime, come by the Museum to see our refreshed galleries, and why not plan an excursion to visit these other great local places, and experience what they have to offer! It’s been a busy month at the Chilliwack Museum and Archives! This week, we opened our latest exhibition, Sq’éwlets: A Stó:lō-Coast Salish Community in the Fraser River Valley. To bring you this exhibition, the Museum partnered with the Stó:lō Research and Resource Management Centre in collaboration with the Sq’éwlets First Nation. The ancient home of the Sq’éwlets First Nation is at the junction of the Fraser and Harrison Rivers. 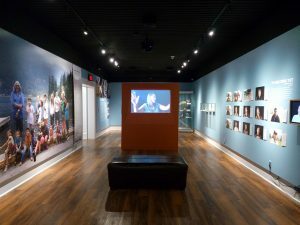 The history of the Sq’éwlets people from their ancient origins, up to the present day, is shared in the exhibition through videos, cultural belongings, and photos. 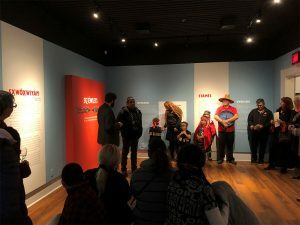 A notable aspect of the presentation is that the content wasn’t written or generated by the Museum staff—it was created by the community at Sq’éwlets, from their perspective, and in their words. Self-representation and personal voice are key aspects of the exhibition programme. Visitors will find that the Halq’eméylem language is used prominently throughout the display. In the exhibition texts, you will notice a small but significant change in terminology. Rather than the commonly used term “artifact” or “object,” the material culture on display is referred to as “belongings.” Alongside the belongings, you will also see historical and contemporary photographs of belongings being used. The reasoning behind this is multi-faceted, but one of our goals is to emphasize that these items and technologies are still utilized and practiced today, as they have been for generations. Perhaps most important is to acknowledge that the material culture on display belongs to the Sq’éwlets community and their ancestors. 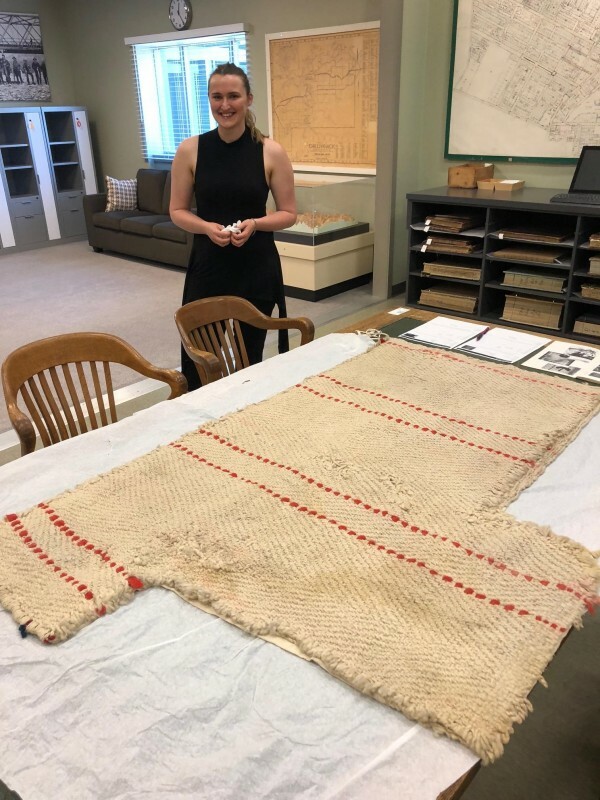 For an in-depth discussion on museological use of the term “belonging” in regards to Coast Salish material culture, check out the following article, Belongings” in “c̓əsnaʔəm: the city before the city. The exhibition opened on November 2nd, and despite Chilliwack’s first snowfall of the season, many visitors were present. To start the event, a welcome was provided Chief Robert Combes of the local Skwah First Nation. Chief Andy Phillips of the Sq’éwlets First Nation then introduced the project, followed by traditional song and dance led by Johnny Williams on drum. City Councillor Sue Attrill then spoke a few words, along with Museum Director Matthew Francis. To all of the folks who braved the weather and difficult roads to celebrate this new exhibition, we thank you! Sq’éwlets: A Stó:lō–Coast Salish Community in the Fraser River Valley is on display from November 2, 2017 to April 28, 2018. Read further about the exhibition here. (Museum) Membership has its privileges! Who remembers the popular credit card commercial, “Membership has its privileges“? It was a catchy line that made that little plastic rectangle feel like a badge of honour, a special club you wanted to be a part of. Membership does mean something. It can mean quite a lot, in fact. But history shows us that participation in membership-based organizations in Canada is changing and morphing quite a bit these days. 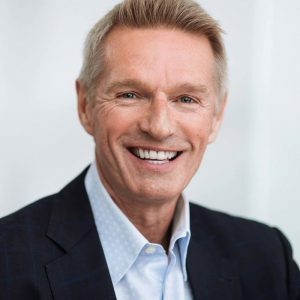 Trends show that membership-based organizations – particularly service clubs and other voluntary societies – have been steadily declining over the past 40 years. Across the same period, it’s interesting to note that both attendance and membership in history museums, art galleries, and recreational sports groups has been on the rise. And, from those numbers, it’s clear that Canadians love their Museums and have significant connections to them. Our vision is to connect people with Chilliwack’s history. If you believe in that vision, the best way that you can put that desire into action is by becoming a member. 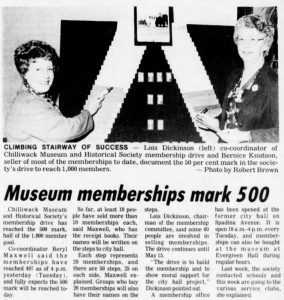 A few times over the past 60 years of our history, the Chilliwack Museum and Historical Society has undertaken membership drives to boost our ranks and strengthen the support of our vision. Our City caught on to the vision, and joined in droves. Of course, in those days, an annual Membership membership was a whopping two-dollar bill (those were pre-“Toonie” days). Story from The Chilliwack Progress, Wednesday, April 18, 1984. In the mid 1980s, when we were campaigning to take on Chilliwack’s historic City Hall as a new home for the Museum, we successfully recruited 1, 912 members, in honour of the construction of City Hall by Thomas Hooper in 1912. 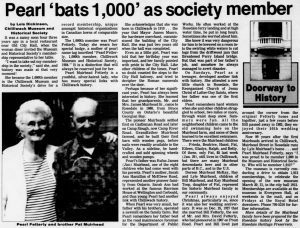 Story from The Chilliwack Progress, on the 1000th member of the Chilliwack Museum and Historical Society, Wednesday, Feb. 4, 1987. This year, to mark our 60th Anniversary, we have the goal of signing up 60 NEW LIFE MEMBERS before the end of 2017. A Life Membership may cost a little more “up front” than an Annual Museum and Archives Membership, but, as they say, “membership has its privileges.” If you’ve been an annual member for a while, why not “upgrade” to a LIFE MEMBERSHIP? You’ll never have to worry about renewing again! Personal invitation to openings, programs, and special events. You can check out all the membership benefits on our website. Of course, if its not the right time for you to become a LIFE MEMBER, then one of our other membership categories is sure to fit your lifestyle. You can even join as a Teacher or Business, and get great perks for your class or employees. Signing up online is easy, or you can come into the Museum any time to activate your membership. Plus – if you are a newcomer to Chilliwack – having moved here within the last 12 months – your first year’s membership is always FREE! Come on into the Museum or give us a call for details! And, as a special bonus, each new Life Member that joins in 2017, will receive as our gift, a copy of our classic book, The Chilliwack Story. Keep this richly illustrated coffee table book, or pass it on to a friend or family member – you can guarantee it will be cherished! Come and join us as we connect people with Chilliwack’s history – become a member today. If you haven’t yet had the chance to visit the Chilliwack Museum and Archives to view the exhibition Photography: from Obscura to App this week is your last chance. Installation image from the exhibition. Photograph by Lori Johnson. Presenting a brief survey of the history of photography, the exhibition begins with the first forays into the technology, such as the daguerreotype, up to present day digital technologies. On display are pictures and artifacts relating to Chilliwack’s history, from James Orville Booen’s stunning photographs, to equipment sourced from the old Paramount Theatre. Read more about the exhibition in this article from the Chilliwack Progress. Norman Williams at the opening reception. Photograph by Lori Johnson. The opening reception for the exhibition was held on September 22, 2016, and was well-attended by community members. 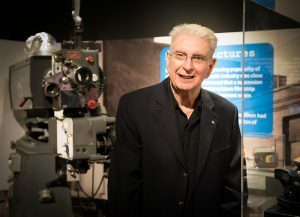 Among the many attendees, especially fitting was the presence of photographers Don Young, Lori Johnson, Jenna Hauck (of the Progress), and Norman Williams (long-time photographer and owner of Norman’s Photographic Studio in Chilliwack). Visitor interaction and community outreach were key aspects of the exhibition programming. From an interactive timeline, to a chalkboard wall where visitors were asked to record their relationship to photography, persons both young and old were encouraged to participate and make their mark within the exhibition. What do Chilliwackian’s like to photograph? Everything from “places I visit,” to “my loved ones <3,” and “doors!” So far, the exhibition has received over 1100 visitors during its display period. Click here to view the results of our interactive Kidtography exhibition, which is on display at the Museum until June 11th. Visitors at a “hands-on” display during the opening reception. Photograph by Lori Johnson. With the influx of digital technologies, it is difficult to predict the future of photography. It is poignant that one visitor to the exhibition left the following sentence in our guestbook: “developer 2 min / stop 15 seconds / fix 4 min / wash 4 min.” These are instructions for blackroom developing. How soon will it be, before the meaning of this sentence will be left to the history books? Photography: from Obscura to App closes on Sunday June 11, 2017. 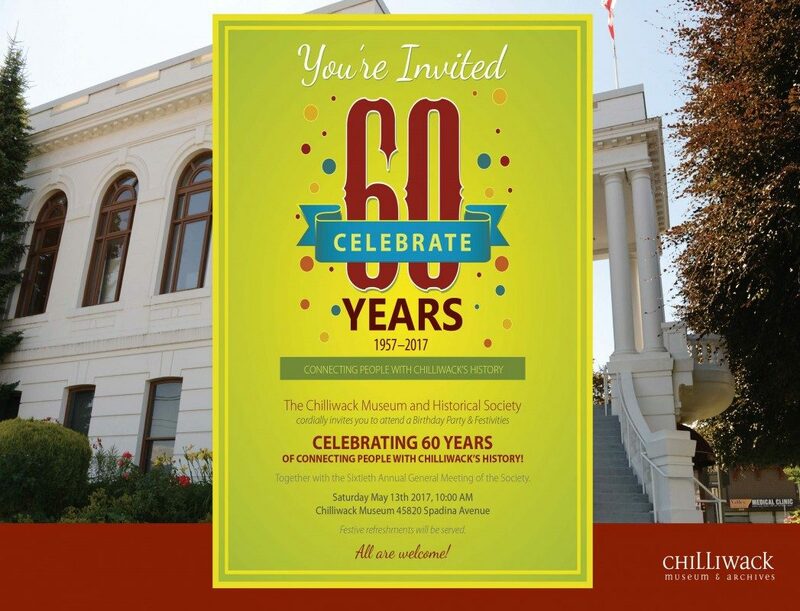 Chilliwack Museum and Historical Society Celebrates 60 Years! Come celebrate with us! The Chilliwack Museum and Archives’ 60th Birthday Party – Saturday May 13th @ 10am. Everyone’s invited! Sixty years ago, in the Spring of 1957, a committed group of Chilliwack citizens gathered together at the Chilliwack Senior High School for the first official meeting of the Chilliwack Historical Society. 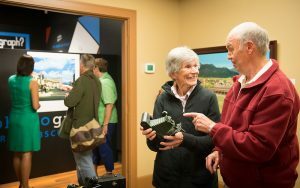 They carried forward a dream which many people had shared since the early years of the 20th century – to establish a Museum to connect people to Chilliwack’s history. Through their hard work and determination, this object was soon realized with the opening of the Chilliwack Museum the following March. 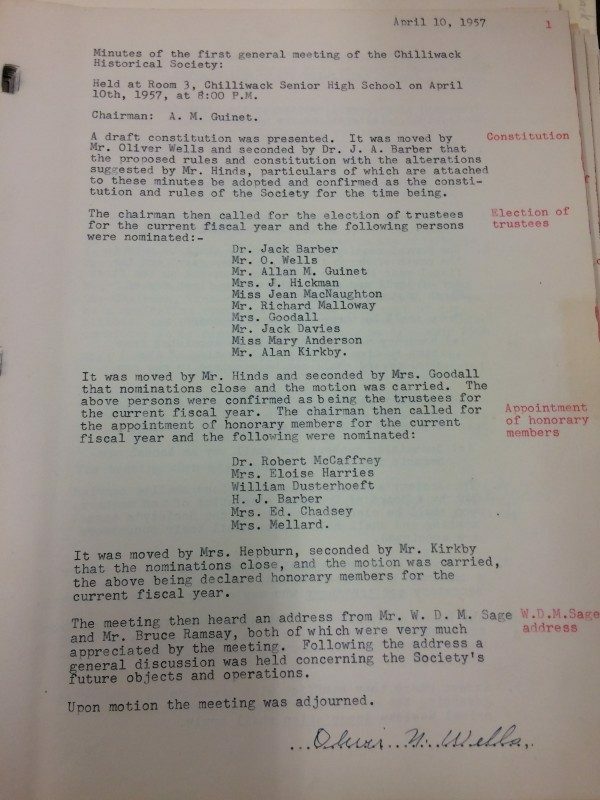 The Minutes of the first General Meeting of the Historical Society, April 10, 1957. 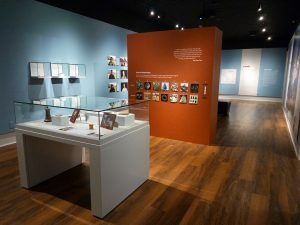 This year – as Canada celebrates 150 years – the Chilliwack Museum and Historical Society is commemorating our own “Diamond Jubilee,” sixty years of connecting our community to the memories, moments, and people, and material culture that mean so much to us. Throughout this 60th Anniversary year, we will be sharing the stories of the Museum’s founders, as well as many others over the years who have shaped the Museum and Archives. This includes such leaders as Oliver N. Wells and Chief Richard Malloway, as well as many others. Together, they all form our collective story – one that is still being written and lived out today. You are invited to be a part of this Chilliwack story! Come and join us Saturday May 13th at 10am, for a good old-fashioned community Birthday Party for the Chilliwack Museum and Archives! 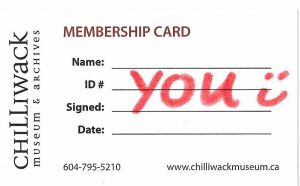 Become a member of the Chilliwack Museum and Historical Society. For more information contact Matthew Francis, Executive Director, Chilliwack Museum and Archives at [email protected] or (604) 795-5210 ext. 101. Recently Matthew Francis, Executive Director of the Chilliwack Museum and Archives, had the opportunity to sit down for a conversation with Merlin Bunt. Merlin is a proud member of the Chilliwack Museum and Historical Society, and was elected to serve on our Board of Directors last year. He is also the researcher and writer behind the popular “Chilliwack History Perspectives” Facebook page. In this interview, Merlin shares about his own keen interest in Chilliwack’s history, his personal connection to Chilliwack, and why history matters. 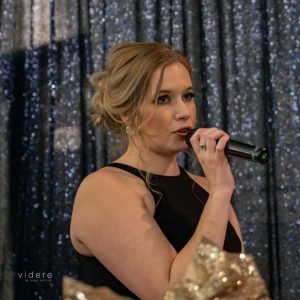 Merlin – can you describe some of your own personal background and your connection to Chilliwack? I am a fifth-generation Chilliwackian, born here in the early 1950s, and my great-great-grandfather is Isaac Kipp, often referred to as the ‘father’ of Chilliwack. I have fond memories of being raised in Chilliwack. Isaac Kipp Farmhouse. 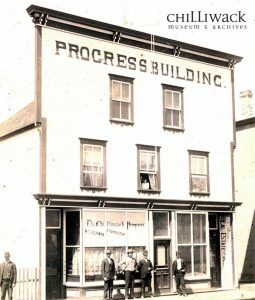 Chilliwack Museum and Archives Photograph, P720. Since I spent my first 23 years here, in an era quite different from today, I greatly care about its past, present, and future. I have three daughters, each one a lawyer. When I am not working, my hobbies include lawn bowling, hiking, cycling, and chronicling Chilliwack’s history. People would be interested to know about your professional background. What can you tell us about that? After graduating from CSSS in 1971, I attended UBC and graduated with a B. Com. degree in 1976. Later, I became a Chartered Professional Accountant. Today I work for myself, providing financial consulting and editing/writing services for my clients. You have an active interest in “connecting people to Chilliwack’s history,” researching and writing about locally significant historic places and events. Can you tell us a little about your popular Chilliwack History Perspectives Facebook page? As I mentioned, my ancestors were integrally involved in the development of early Chilliwack. My grandmother, Irene Bunt (nee Knight, born in Popkum in 1891 and passed away in Chilliwack in 1988) had a real passion for Chilliwack’s history (as she was witness to a good portion of it), she attempted to spark my interest in it. Her grandfather was Isaac Kipp, and she would often tell me about him and early Chilliwack. However, I was then living in Vancouver, with three children and a busy career, and my interest in Chilliwack’s history did not match hers, to say the least. However, in recent years, as the nature of Chilliwack evolved, and certain physical elements of its history were no longer with us, along with finding myself with more time, my interest in Chilliwack’s history became much more focused. I finally joined Facebook in 2013, and as I enjoy writing, I found that I wanted to put ‘on the record’ certain aspects of Chilliwack’s history, including the perspectives of my ancestors and me. 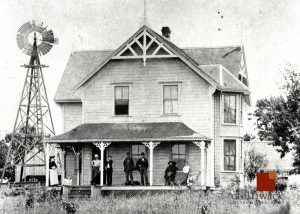 I started posting some informal accounts of Chilliwack history, and initial response was very positive, and thus in 2014 I created a Facebook Page dedicated to Chilliwack history called “Chilliwack History Perspectives”. As time allows, I try to post a new article every two weeks, on Sunday mornings. 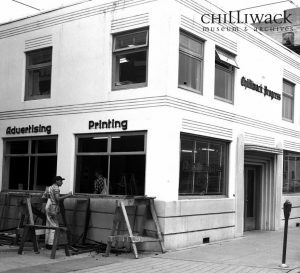 To date, I have posted over 80 articles on Chilliwack’s history on this Page. You were elected to serve on the Board of Directors of the Museum last year, and we have really appreciated your participation and insights. What have you enjoyed about this experience so far? I do quite enjoy being a member of the Museum’s Board of Directors, largely because everyone in the room has some connection to the history of Chilliwack, and a common commitment and passion to preserve it, enhance it, and share it with the area’s citizens. It is also gratifying to have input to the stewardship of Chilliwack’s history, through both the Museum and the Archives, such that future generations can benefit and learn from our efforts now. Beyond that, everyone associated with the Board and the Museum is very nice! What do you enjoy doing for fun or recreation in Chilliwack? I have recently become an avid lawn bowler, and I am on the Chilliwack Lawn Bowling Club’s Board of Directors. 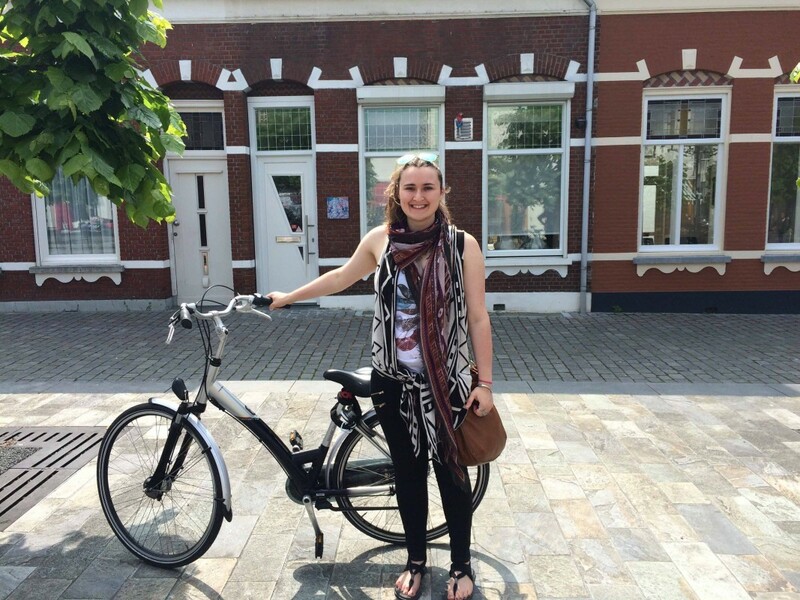 I also like going for early-morning bike rides (preferably when it is sunny) in which I ride past many historic Chilliwack locations, as well as places of personal memories for me. During these rides, I have my smartphone with me, and occasionally if I see a worthy scene, I will stop and photograph it. I will often stop just to visualize how something was, as opposed to how it is. Also, this coming summer, a group of us Chilliwack natives (and fans) are planning to climb Mt. Cheam. Why should people explore Chilliwack’s history? Chilliwack has a rich and significant history, and being a growing city approaching 90,000 citizens, knowing its roots and foundations gives an appreciation of how it was, thus allowing us to understand where we are today, to perhaps better deal with what lies ahead tomorrow. Also, sometimes it’s just fun to ‘escape’ to yesteryear, when times were simpler. Thanks, Merlin, for taking the time to talk with us!